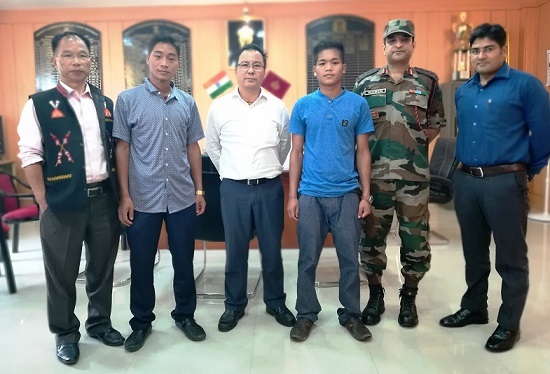 Wangliam Lowang, a 19-year-old NSCN (K) cadre voluntarily surrendered himself in front of the district administration and police in Khonsaon Monday. Khonsa, the district headquarters of Tirap is around 318 kms from here. Wangliam who was an active cadre of the Khaplang faction of NSCN since 2016, in his statement said that he agreed to give up arms in order to live a simple and normal life with his parents and family members. Wangliam was 17 years old and studying in Class VIII at the Government Middle School, Changlang when he decided to join the outfit. His father Late Wangmi Lowang was also a NSCN (K) rebel and was killed during an encounter between the underground outfit and security forces in Nampong under Changlang district in the year 2015. “I am physically weak and suffering from bad health for a few months now. As such, I have no future working for an underground group as NSCN (K) and have decided to live a normal family life with my parents,” Wangliam said. Wangliam who belongs to the Noglo village under Lazu administrative circle of the Tirap district has so far not disclosed any information about his past activities considering for his safety. No arms were recovered from the surrendered cadre either. Among others, the formal surrender programmeon Mondaywas attended by deputy commissioner, P N Thungon, SP JK Meena, Noglo village chief Wanglet Lowang, Commandant 16 Assam Rifles and the elder brother of Wangliam.